I was diagnosed with breast cancer at the age of 29, 1 week after returning from my honeymoon. Therefore the year that followed was a really challenging one for both my husband and I as we faced surgery, chemotherapy and radiotherapy treatments together. 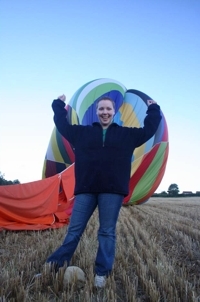 Therefore being able to go on a thrilling hot-air balloon ride on my 1st wedding anniversary and 1 week after finishing my treatment really marked the end of a challenging year for us. The balloon ride was just the most fantastic experience ever. I can’t begin to tell you, but I will have a good go! 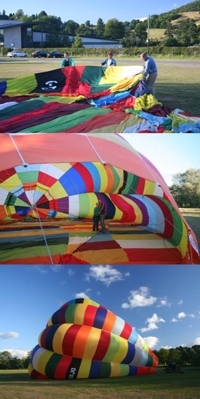 We first got stuck in helping to inflate the balloon and set it all up ready for our “Exclusive for Two” flight. Then it was jump in and lift off. Take off was a really funny sensation, like being on a huge open-air elevator, I loved the feeling and it felt so safe up in the air too. 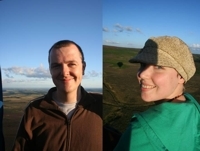 We first flew over the Peak district and Chatsworth House and then the wind carried us over the rooftops of Chesterfield. We flew so low over the houses I was even able to wave to the people below. The landing was pretty bumpy and the basket ended up on its side so we really felt we had received the full ballooning experience. All in all it was just amazing. It is all thanks to Challenge Cancer Through Adventure. They arranged it all for me and even turned up to get stuck in with the balloon inflating. I cannot begin to express how much I appreciated it. I would recommend a balloon flight to anyone. Thanks everyone from James and I.